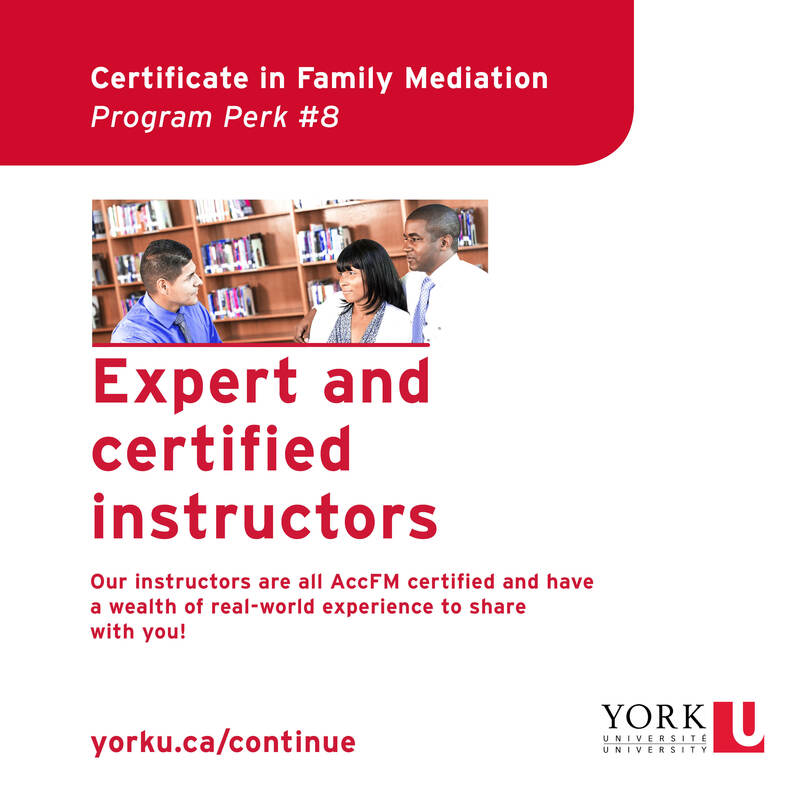 The Certificate in Family Mediation gives you the skills and experience you need to confidently mediate conflict and assess for family violence, while completing the training requirements for the AccFM designation of the Ontario Association for Family Mediation—the largest accreditor of Ontario family mediators. The AccFM is formally recognized by the Ministry of the Attorney General, opening the door for you to work within the Ontario court system. 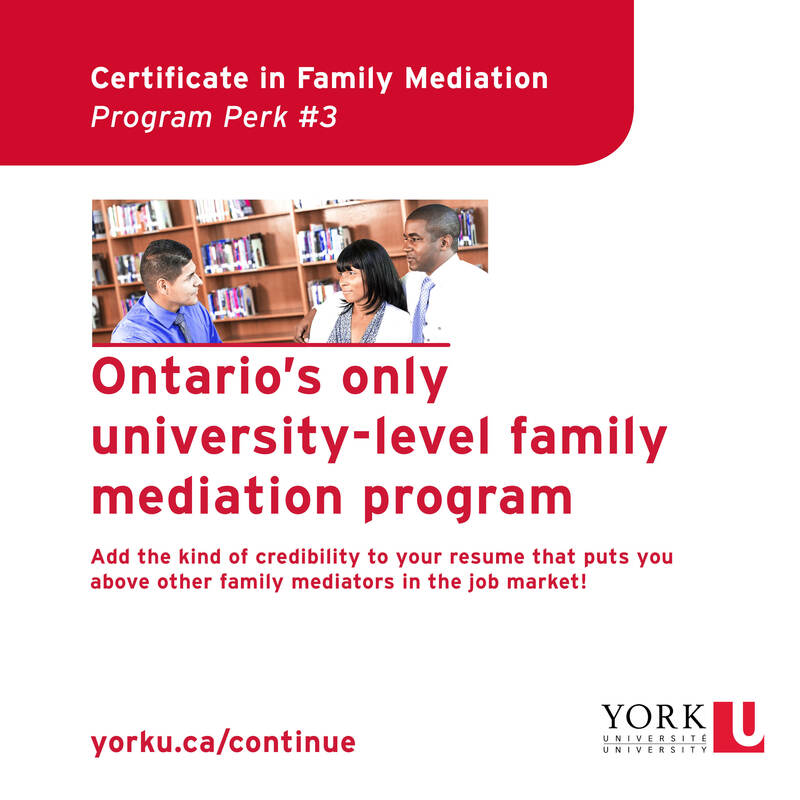 Graduating from our Certificate in Family Mediation gives you an edge over other mediators in the field, allowing you to add a credible university credential to your resume. You also enjoy the benefits of learning from expert instructors, hand selected for their real-world experience and AccFM certification. Program content is supplemented by their firsthand knowledge in dealing with the types of challenging situations you’re going to face as an accredited family mediator, as well as the opportunity for you to network with likeminded peers in your program. You’ll also participate in dynamic role-playing sessions facilitated by seasoned coaches, allowing you to put your mediation skills to the test and improve your confidence. 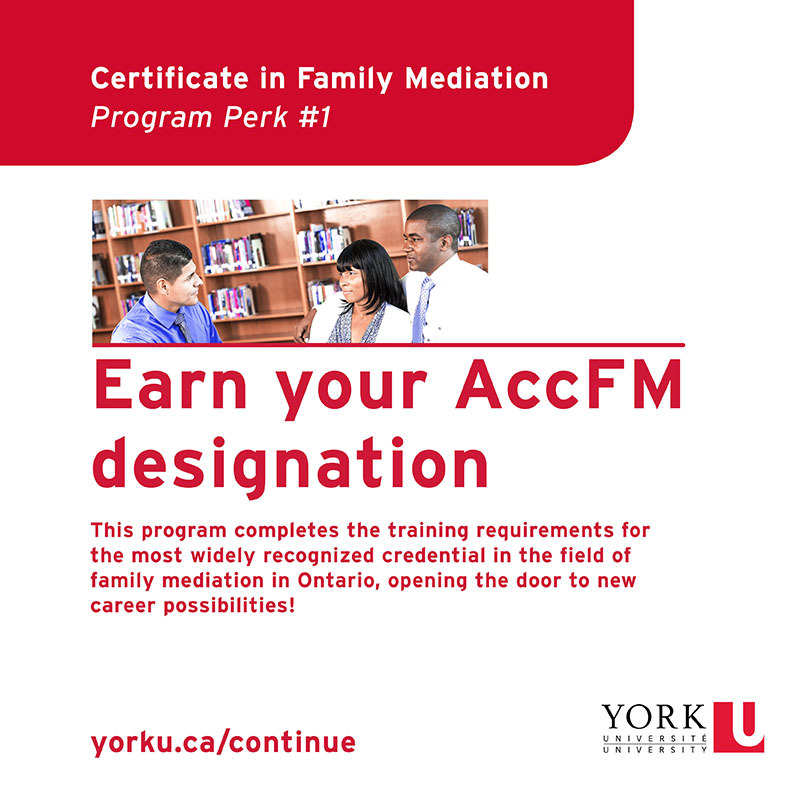 The AccFM designation requires you to complete an internship with an accredited family mediator. 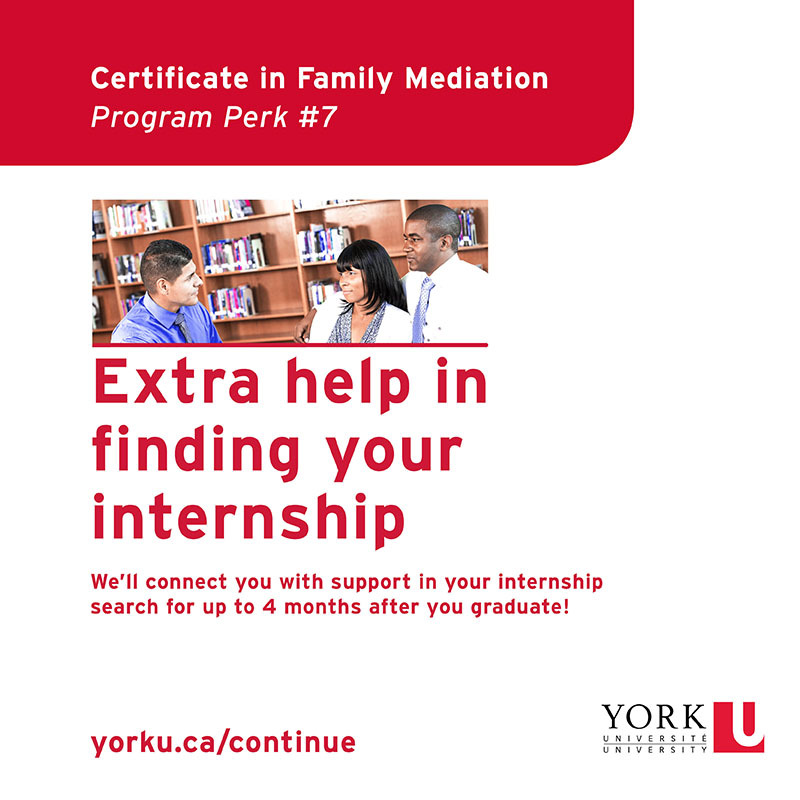 The Certificate in Family Mediation is accelerated, giving you a quicker path to your internship. Our certificate is also the only program in the field that sets you up for success in finding a placement by providing you with grades from skills-based assessment and evaluation, so you can provide tangible proof of your abilities, in the form of a learning portfolio, to your potential internship provider. We also connect you with support in finding an internship for up to four months after you graduate. The Certificate in Family mediation is offered in both intensive and part-time formats. Both formats are delivered in class on our Keele Campus in Toronto, ON. 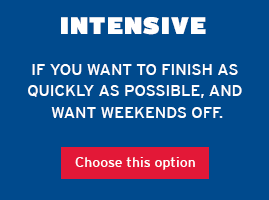 The intensive option allows you to complete the program in just five weeks. Classes take place from 9:00am-5:00pm, three days a week on Tuesday-Thursday. 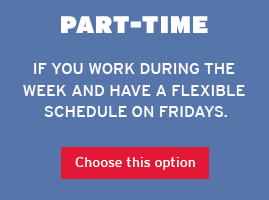 The part time option allows you to complete the program in seven months. Classes take place once a month from 9:00am-5:00pm, three days a week on Friday-Sunday. The Certificate in Family Mediation is for anyone who is currently or prospectively involved in family dispute resolution, and especially those who want to gain formal certification. While many students in this program are lawyers and social workers, others work in healthcare, education, personal support services and trust management. Taking into account the specific existing expertise of lawyers and social workers, these two groups are exempt from one course each, reducing the course load to four. This Certificate Program consists of five courses, listed below. Each course combines lecture, interactive teaching models, exercises, and role-plays (where applicable), specifically designed for our Certificate. This introductory course exposes students to fundamental theory of conflict and its corresponding nature, causes and cycle. Students will also become acquainted with the history of Alternative Dispute Resolution, the dispute resolution spectrum, and the principle of informed consent. From there, students will engage in more nuanced learning as it relates to the nature of negotiation and related strategies, tactics and skills, as well as appropriate alternatives. Relationship separation is a critical juncture in people’s lives leaving some vulnerable to intimidation, pressure, emotional harm, abuse, neglect, serious injury or death. 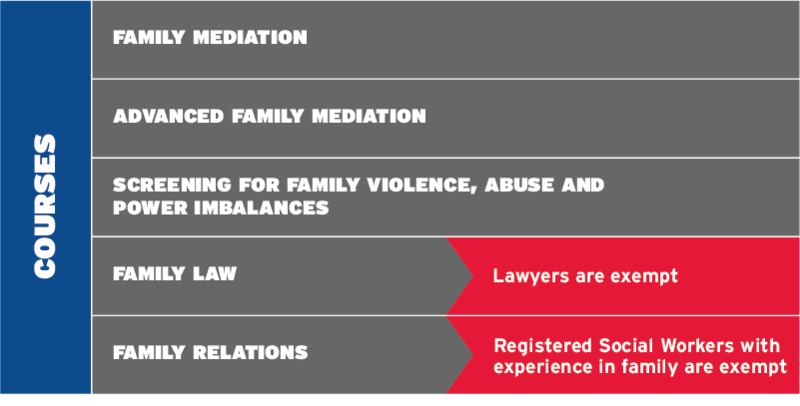 Family Mediators must understand domestic violence and power imbalances within the context of family dynamics and family mediation services. Participants shall learn how to adequately screen for domestic violence and power imbalances; learn about the kind of cases appropriate for mediation and those that are not; how to support a client with a referral to other services; how to safely terminate mediation; and, how to add safety measures to provide a safe environment for mediation. Participants shall learn about domestic violence, power imbalances and abuse, and have the opportunity to practice what they learn through case study and role playing as a mediator. This course examines marriage and divorce as it relates to the law-making systems in effect in Canada and Ontario. Students will go in-depth into the about principal issues in family proceedings (i.e. parenting, child support, spousal support, property) for the purposes of informing students on legal implications for mediated settlements for divorcing partners. This course explores through a theoretical framework of family systems theory the various considerations of child development, attachment, causes of conflict, and extension of the original family in the context of separation and divorce. Students will also deconstruct the politics of separation, examine historical traditions, and utilize various narrative and therapeutic approaches to facilitate processes of grieving and separation recovering. This course focuses on the application of mediation skills and knowledge in a variety of contexts and primarily through experiential learning. Students will focus on demonstrating skills related to a variety of advanced topics such as high conflict families, conflict resolution models, advanced communication techniques, step-parenting and multi-party mediation, cultural diversity, mediation with persons with disabilities, and trauma informed practices. Anisa has been the Family Mediator and Settlement Conference Facilitator for Legal Aid Ontario (LAO) Peel/York for the past 10 years. Prior to LAO, she worked for 8 years with the Ministry Of Attorney General Family Mediation Provider (Blue Hills Child and Family Services) at the Superior Court of Justice Newmarket, Ontario as a Family Mediator/Information Referral Coordinator. An accredited family mediator since 2002, she holds a Masters of Social Work degree from University of Windsor and a Bachelors of Arts from York University. She bring over 18 years of experience in the field of conflict resolution, mediation, negotiation and training. Anisa volunteers as the current Chair of Peel Family Mediation Service and has been a Board member since 2011. For the past six years she has been responsible for Peel Family Mediation Annual Domestic Violence Symposium where she gather professionals and experts from within Ontario for day of enlightened training and networking. Since 2015, Anisa has been a guest lecturer at York University Social Work (BSW & MSW) Family Mediation courses. She works on family mediation and domestic violence/power imbalance course development and training at Humber College ADR Program; Peel Family Mediation Services Internship training, Legal Aid Ontario training programs and community workshops within Greater Toronto Area and Kitchener-Waterloo area. Anisa also supervises BSW, MSW and Humber ADR students at her workplace throughout the year. 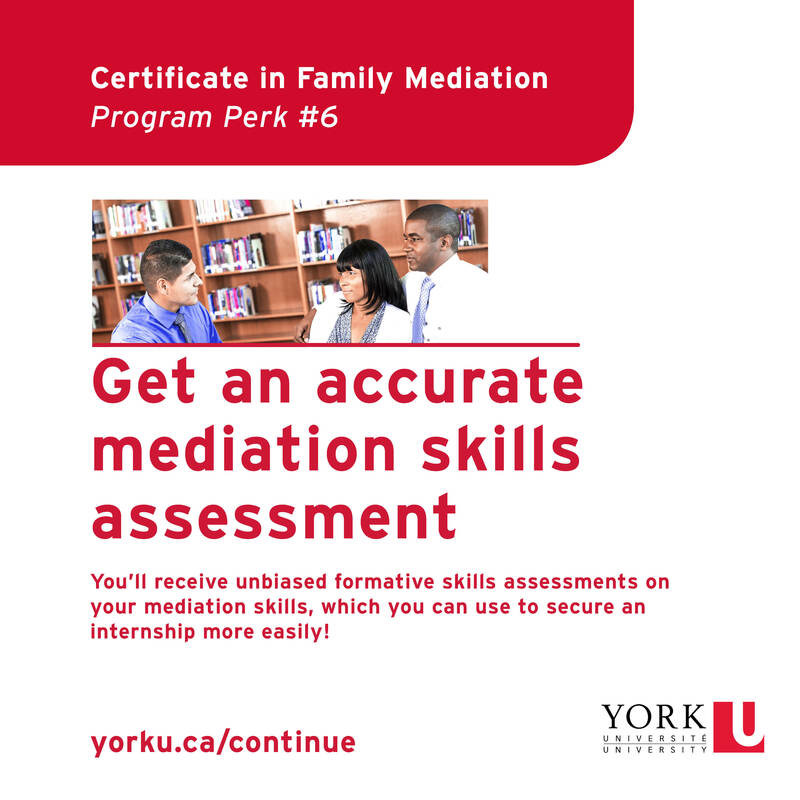 Lorraine is delighted with the opportunity to contribute to the development of the Mediation Certificate Program at YorkU along with a brilliant new team of Family Law professionals. As Instructor of the Family Law course in the program, she strives to bring value to YorkU’s students from her long and rich experience as a lawyer in the Family Law field for the past 34 years. She is the founding lawyer of Bortolussi Family Law, Lawyers-Mediators-Arbitrators, where the practice of all associates at the law firm is focussed on Family Law and helping people through separation and divorce in the most constructive way possible. 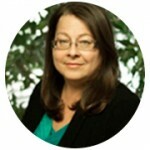 Lorraine is an accredited Family Mediator through the Ontario Association for Family Mediation (OAFM) and is the OAFM’s immediate past president. She is also a Collaborative Family Practitioner. She represents clients in complex cases and is trained and skilled in the entire spectrum of dispute resolution processes including negotiation, mediation, Collaborative Family Practice and Arbitration. Her focus for years has been helping her clients settle through comprehensive mediation or in Collaborative Family Practice, where all issues arising out of a separation, including parenting, child support, spousal support, and complex property (including businesses) issues, are resolved. 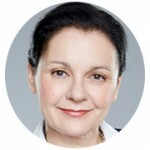 Her mediation training includes completion of the Harvard University Law School Mediation Workshop (2001) and a Master of Laws degree specializing in Alternative Dispute Resolution from Osgoode Hall Law School at York University (2006). She has also assisted as a guest lecturer and mediation coach for law students in mediation courses at Osgoode Hall, and has served as an instructor at the Bar Admission Course, Family Law Section. Lorraine presently serves part-time as a Deputy Judge of the Small Claims Court, a branch of the Ontario Superior Court of Justice. She also served for six years as a Vice-Chair of the Province of Ontario’s Workplace Safety and Insurance Appeals Tribunal (WSIAT), the final level of appeal for final decisions of the Workplace Safety and Insurance Board. Prior to that, she served for five years as member of the Province of Ontario’s Licence Appeal Tribunal. 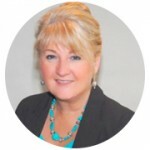 Cindy Holovac Leithead has over 30 years of experience assisting individuals, families and groups with various disputes in negotiating and mediating and creating their own resolutions. As an accredited family mediator, Cindy’s private practice, CINDIAIN Resolutions Services, provides family mediation, child protection mediation, openness in adoption mediation, elder mediation, civil mediation and workplace mediation. She is on the ADRIO roster as an Independent Complaint Facilitator for Community Care Access Centres (CCAC). She is also the co-chair of the special section Family at ADRIO. Cindy is also on the roster at several court-based family mediation services in Ontario, as a mediator, internship supervisor, Information Referral Coordinator (IRC), and Mandatory Information Program (MIP) Presenter. 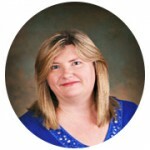 Prior to commencing her mediation practice Cindy was a senior manager in the Ontario Public Service focusing on workplace issues and labour relations among staff and stakeholders. She has also worked with individuals and families specializing in domestic violence and substance abuse. 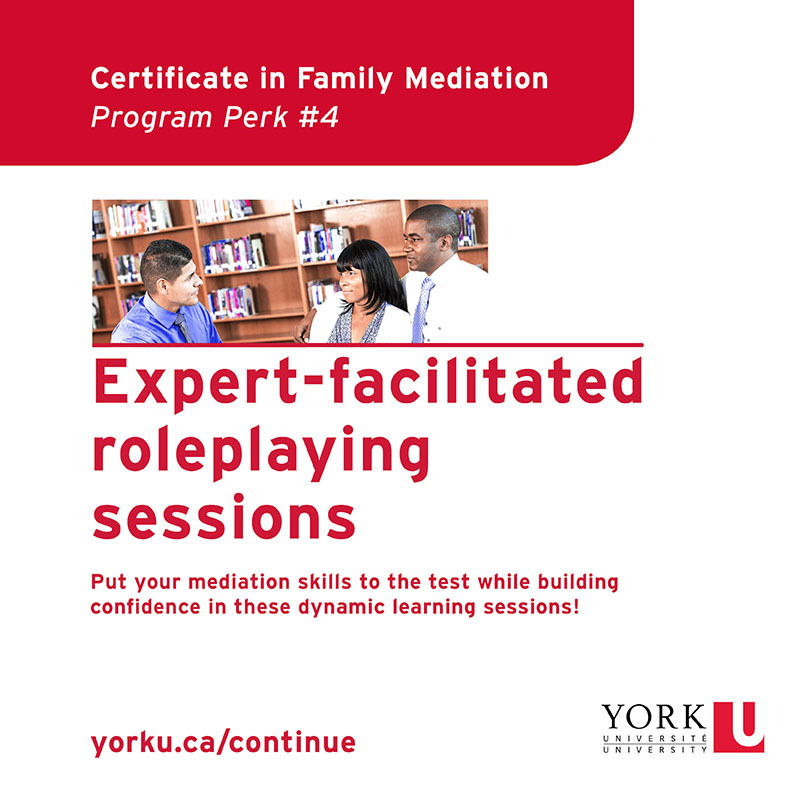 For several years Cindy has been coaching and most recently instructing at York University’s School of Continuing Studies for the Certificate in Dispute Resolution and the Certificate in Family Mediation. 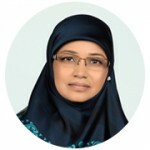 She is also a Dispute Resolution Educator in the Advanced Certificate in Dispute Resolution. Cindy is also a coach for the Osgoode Hall Law Society, Mediation Clinic and Intensive Program at Small Claims Court. Debra Rodrigues, a Registered Social Worker, has more than 30 years’ experience working with families. Deemed an expert in family matters by the Courts, she has presented at numerous conferences including the Ontario Courts of Justice Conference, Ontario Association of Family Mediation and Family Mediation Canada conferences. She has been professionally quoted in magazines and newspapers and has appeared on television programs. Her professional background is extensive: Director of PCCS Mediators & Counsellors, Family Mediator, Elder Mediator, Child Protection Mediator, Workplace Mediator, Custody and Access Assessor, Office of the Children’s Lawyer Clinical Investigator, Parenting Coordinator, Family Group Conference Coordinator, Capacity Assessor, Parenting Capacity Assessor, Arbitrator, Collaborative Family Specialist, Facilitator, ADR Consultant, Counsellor, Group Leader, Clinical Auditor, Child Welfare Trainer and as a trainer for a variety of public and private organizations. Currently Ms. Rodrigues is an instructor for the OAFM Child Protection Mediation program and for the York University Family Mediation Certificate Program and supervises mediation interns. Ms. Rodrigues passionately believes that mediation is more than just an agreement between parties but that it’s also an opportunity for renewing relationships, improving children’s lives and helping people cope with the stress and anxiety of separation. She brings her vast experience to the course on Domestic Violence and explains that Domestic Violence in mediation comes with a large flashing yellow yield sign to assess before proceeding. Jennifer Suzor is an experienced Family Law lawyer, mediator and trainer based in Windsor, Ontario. Having practiced in all levels of the Court for thirty years, Jennifer now focuses on neutral consultation and non-court dispute resolution, primarily mediation. Jennifer was certified by the Law Society of Upper Canada as a Specialist in Family Law in 2004 and has been accredited in family mediation, child protection mediation and elder mediation by the Ontario Association for Family Mediation (OAFM). Jennifer has served as President of OAFM since 2013. In 2016, Jennifer received the President’s Award from the Association for Family and Conciliation Courts, Ontario Chapter, in recognition of her volunteer work as Co-Chair of the Walsh Family Negotiation Competition and her vision of creating a series of events in Windsor called “Changing the Culture of Conflict Resolution in Family Breakdown Roundtable Dinner Series” for the Judiciary, Counsel, Psychologists, Social Workers and other family professionals. She is the President of Bridging Family Conflict, the service provider in Windsor for the Ministry of Attorney General subsidized mediation and information services. related college diploma with experience in human services. 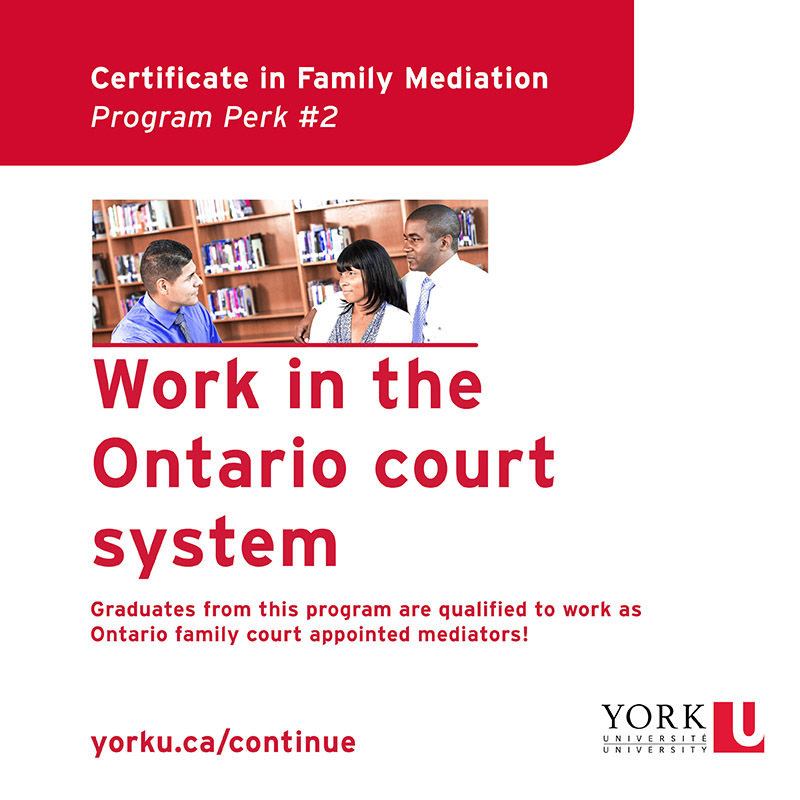 The certificate program satisfies the training requirements of the Ontario Association for Family Mediation, as well as Family Mediation Canada. If you would like more information or have a question about the Certificate in Family Mediation, please contact us. Online – Visit our website at continue.yorku.ca to register in any course or program offered by the Continuing and Professional Education. Fax – (For credit card payments only) Complete the registration form, including credit card information. Fax to 416-650-8042, with program-specific documentation (i.e., proof of degree). Mail – Complete the Registration Form and mail to the Continuing and Professional Education. All applications are processed on a first-come, first-served basis, so early registration is recommended. The School of Continuing Studies reserves the right to alter fees, other charges, instructors, and course dates/locations described in this brochure. Certificate in Family Mediation – The first payment of $2,499 is due upon registration with the balance due by November 1 for the Fall Program or June 1 for the Summer Program. A student that fails to make installment payments as required will not be permitted to continue in the program. All correspondence, including your registration confirmation, grade report, and refund cheque, will be sent to the “mailing address” provided at the time of registration. Students must contact the Program Manager for permission to transfer to another session. Transfer requests are only granted for documented medical reasons. When necessary, the School of Continuing Studies may alter, postpone, or cancel classes. In these instances, students will be notified by e-mail, based on the information provided at the time of registration. Elementary Mathematics – Students already admitted to YORK UNIVERSITY who earn a grade of “B” or better will gain automatic entrance to AK/MATH1710.06 and will be exempt from the pre-requisite test. Academic Bridging Studies – Does not meet Admission requirements. Student cannot repeat the same Academic Bridging course but can enroll in the other Academic Bridging course.